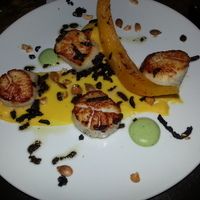 1 review of Midtown Grill, first by lb8er. Went to Midtown Grill for breakfast. Went on a weekday morning and the restaurant was packed. I was dining alone, so I opted to sit at the counter. I actually liked this option as I was able to watch the cooks make the food, which to me was fascinating. The service was very friendly – like a hometown vibe. The menu has creative names for the dishes, and I opted for the ‘piggy back benny’, which come with your choice of ham or pork belly. I couldn’t decide between fruit or potatoes, and went with the servers recommendation of the potatoes, and I’m glad I did. The place is quaint with a friendly vibe and good food. I need to try more! Great version of an eggs benedict with the port belly. And the potatoes on the side are hot, fresh and fantastic! These dishes from the Midtown Grill menu are contributed by Menuism users directly, as part of a restaurant review, or as part of a photo upload. Do you own Midtown Grill? Contact us to connect with your diners. Midtown Grill is located near the cities of West Allis and West Milwaukee.